DAMASCUS, MD. – The first drive of our week with the C-HR came on a day with gusty winds that prompted all kinds of weather warnings. A perfect chance to see how this controversially styled small SUV stood up to howling cross winds of up to 50 mph that were roaring across open pastures along Route 340 en route to historic Harpers Ferry, WVA. In short, it handled those challenges with nary a wander out of its assigned lane as operators of high sided vans fought to stay on their selected course. Hmm, maybe there is something to this design? The C-HR sports a 2.0 liter four with 144 hp @ 6,100 rpm with 139 lb-ft of torque @ 3,900 tied to a CVT. It needs more get up and go. Merging on to fast moving highways requires planning as does any passing of slow moving trucks and agricultural equipment on rural roads. One can manually select gears (?) via the shift lever, but no noticeable improvement was detected. Economy wise however, the picture brightens. On 87 octane, the EPA predicts 27 city, 31 highway, for a combined 29 mpg. On a day long trip, 35 mpg was recorded. The 13.2 gallon tank was a quick fill at a pit stop. Front seat passengers have ample room, and two shorter adults can fit in back, but mind the low slung roof design. In other words, duck a little. The XLE Premium Package brought forth among other items, heated front seat with driver’s power lumbar adjustment, puddle lamps, push button start, Blind Spot Monitor, Rear Cross Traffic Alert, Fog Lights, and folding rear view mirrors. Standard Dual Zone Automatic Climate Control was a nice touch at this price range. Missing was Android Auto and Apple CarPlay. It did take some getting used to – the backup camera appeared only in the rear view mirror instead of the 7- inch center screen. One can fold down the second row seats for additional storage, up to 36 cubic feet and a bit less than the competition. With carpeted floor mats, and Paint Protection Film the test C-HR came to a reasonable $28,794 with delivery. 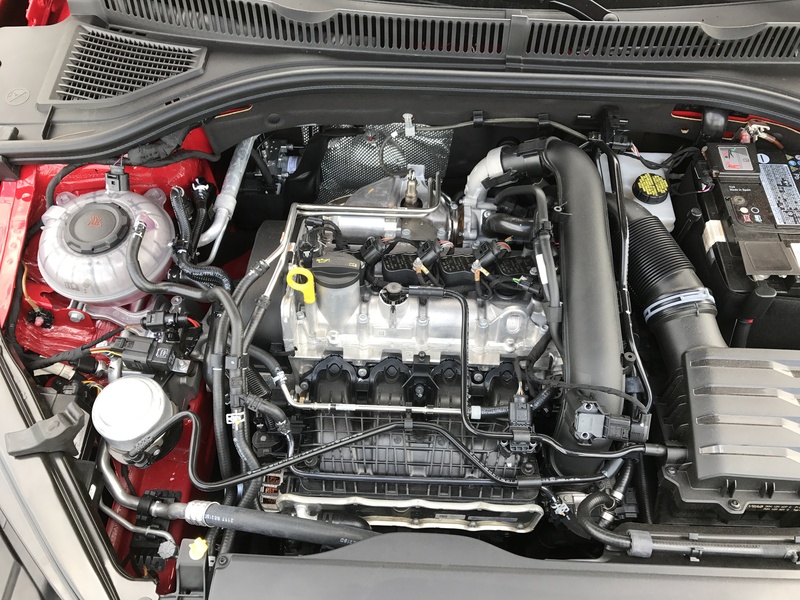 Excellent build quality, fit and finish, and Toyota’s reputation for long life with good fuel economy are all gold star material for the C-HR. It just needs some additional horsepower and torque to match its, (to some) exterior design. There are two trim levels, XL and the tested XLE. The XL carries a starting MSRP of $22,500. The C-HR was first shown in concept form at the 2014 Paris Motor Show. First this morning, as someone who worked his entire life in the news gathering business, allow me to express my condolences to the families of the five people killed in a shooting incident at the newspaper in Annapolis, Maryland. After the horrific shotgun fire, with people diving for cover under their desks as their colleagues were killed by someone with a grudge against the paper, with the realization that they too were facing possible death, the men and women of the Capital Gazette had to find a way put all that aside. They upheld the finest traditions of the news business and somehow, somehow, they put out a paper this morning. The newsprint was mixed with tears. These are extraordinary underpaid people who believe deep down that their readers in the Maryland capitol area have a right to know what’s going on around them. With honest hard working journalists unfairly coming under fire these days, please join me this morning in saluting the men and women of the Capital Gazette while remembering their five colleagues who were shot to death by a madman. When will it all end? I am afraid the answer is never. It appears the big Detroit auto show will no longer take place in the middle of winter starting in the year 2020. The Detroit News reports backers are looking at a June or October date for the show with a formal announcement due next month. That means the 2019 extravaganza will be the final one to be held with snow falling outside. Backers had to consider massive changes after a total of ten brands announced they were pulling out of the Motor City show. Tesla is expected to have more to say about Model 3 production next week, but Reuters is quoting three unidentified workers as saying it will miss its goal of cranking out 5,000 per week. Stay tuned as the soap opera that is Tesla continues. Tesla is asking those who reserved a Model 3 to take the next step and confirm their orders for another $2,500 but CNBC said they will not get a delivery date. With all this going on, Tesla shares closed up nearly 1.6 percent yesterday. “Even though millennials are finally starting to buy new vehicles, the U.S. market is virtually saturated. Add to that record-high vehicle prices, rising interest rates and historically high numbers of people who owe more than their cars are worth, and the stage is set for a market contraction,” said Jeremy Acevedo, manager of industry analysis at Edmunds. Having said that, Edmunds predicts that June auto sales will be slightly higher compared to one year ago. Edmunds forecast a 5.6 percent June sales increase for GM, a fractional gain for Ford with Fiat Chrysler sales posting a healthy 7 percent gain. Automakers will announce their sales figures on July 3. Hyundai has announced pricing for its new 2019 Santa Fe starting at $25,500, an increase of $550 compared with the 2018 model. But the new one will contain a longer list of standard equipment such as additional safety features, Android Auto and Apple CarPlay, and more cargo space. McLaren has donated a 570S Spider to the Elton John AIDS Foundation. The car was auctioned off at a gala event at the star’s home in the UK for $950,000 with all proceeds going to the foundation. An extremely rare Porsche, one of only 39 built, will be auctioned off in Monterey, California in August. It is a 550A Spyder that was also a three-time race winner during the 1958 season with driver Ernst Vogel, who just happened to be a virtuoso composer and professional concert pianist as well as a successful racer—not a combination you see every day. After its European racing tour, the 550A-0141 Spyder was returned to Porsche KG, reconditioned and then sold to Connecticut Porsche dealer and road-racer Harry Blanchard, who entered it in SCCA regional events along the East Coast. Today, the car is owned by Porsche enthusiast Steve Terrien of Issaquah, Washington, who located the car in a warehouse in 1984. Throughout the next 30 years, the car underwent a fanatical comprehensive restoration that was done to exacting standards. Check your Powerball numbers, for this one might just be expensive. While many of today’s infotainment systems create potentially unsafe levels of distraction by allowing drivers to perform complex tasks like programming navigation or sending a text, CarPlay and Android Auto were 24 per cent or 5 seconds faster on average than the vehicle’s native system when making a call and 31 percent or 15 seconds faster when programming navigation. This difference is critical, as drivers who take their eyes off the road for more than two seconds double their risk of a crash. And just in time for your Fourth of July trip, comes word from the AAA that gas prices are moving lower. The national average price is five cents cheaper than one week ago, at $2.85. A total of 49 of the fifty states saw pump prices head your way. Porsche is issuing a voluntary recall and stop sale until further notice for select 2017 and 2018 model year Panamera models in the United States and Puerto Rico. Internal testing showed that there is a possibility that connecting links for the rear-axle anti-roll bar were installed that do not meet Porsche quality standards. A connecting link may become detached from the anti-roll bar. If this occurs, it may come into contact with and damage surrounding suspension parts. Customers will be notified about the recall by mail. There are 715 affected vehicles in the United States and Puerto Rico. No incidents or accidents have been reported. 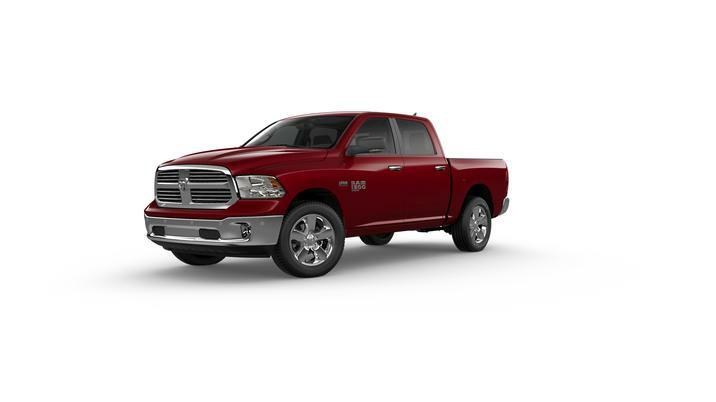 If you would rather own the previous generation Ram truck over the updated current model, you can. Ram will continue to sell the older model and, as is the case with many pickups, there will be multiple configurations. Jaguar will invest $18 billion over the next three years on the development of electric vehicles. The goal is to offer an electric version of all of its models. 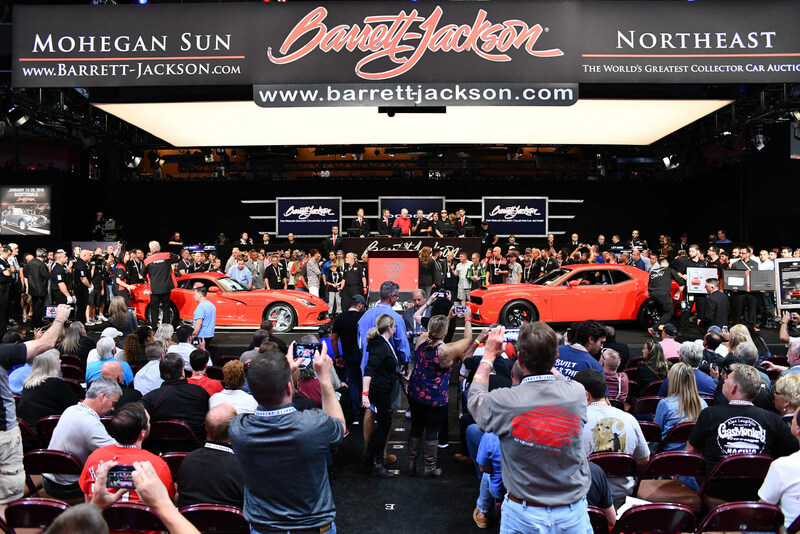 The last 840 horsepower Dodge Challenger SRT Demon and the final 645 horsepower Dodge Viper were sold as a package at a recent Barrett-Jackson auction. All of the winning $1-million bid benefited the United Way. The lot included several pieces of memorabilia, such as authentication kits for each vehicle containing custom build sheets, authenticity letters, certification cards, iPads with videos and pictures, and other custom branded items. We told you about that Volkswagen electric setting a new Pikes Peak record, but Bentley wants you to know it set a record as well. A Bentayga completed the course in 10:49.9 taking nearly two minutes off the previous record for a production SUV. It was a near production model, Bentley said, driven by two-time champion Rhys Millen. 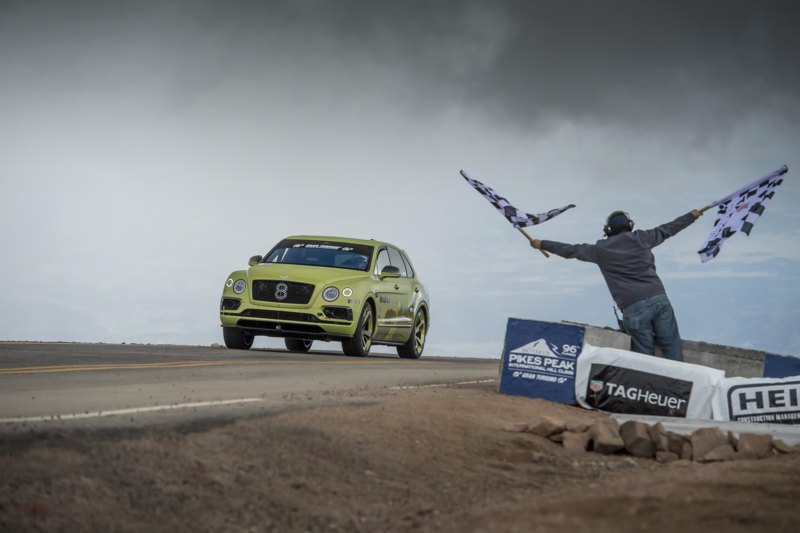 Climbing almost 5,000 ft. through 156 corners, the Bentayga deployed its combination of a 600 horsepower W12 engine, adaptive air suspension, active electric anti-roll control and carbon ceramic brakes to set the record. Only minimal changes were made to a standard production model in order to comply with the rules. The front seats were replaced with racing versions while the rear seats were removed, and a roll cage and fire suppression system were installed. Tires were selected from Pirelli’s DOT-marked range, and a production-specification Akrapovic sports exhaust was fitted. In every other way, the Pikes Peak car was standard Bentayga. In Saudi Arabia, women can now drive cars! So race driver Aseel Al Hamad celebrated the end of the ban with a lap of honor in a Jaguar F-TYPE. “Having loved cars since I was a child, today is highly emotional for me. This is the best driving moment of my life,” Aseel said. There is no better time than a Monday morning to look ahead to the Fourth of July holiday. It may occur midweek, but AAA predicts a record breaking almost 47 million of us will travel 50 miles or more, a more than 5 percent increase from one year ago. A total of 39.7 million will take a road trip with most folks traveling on Tuesday. The Independence Day holiday period is defined as Tuesday, July 3 to Sunday, July 8. And the auto club recommends you check the condition of your tires before hitting the road. The all-electric Volkswagen I.D. 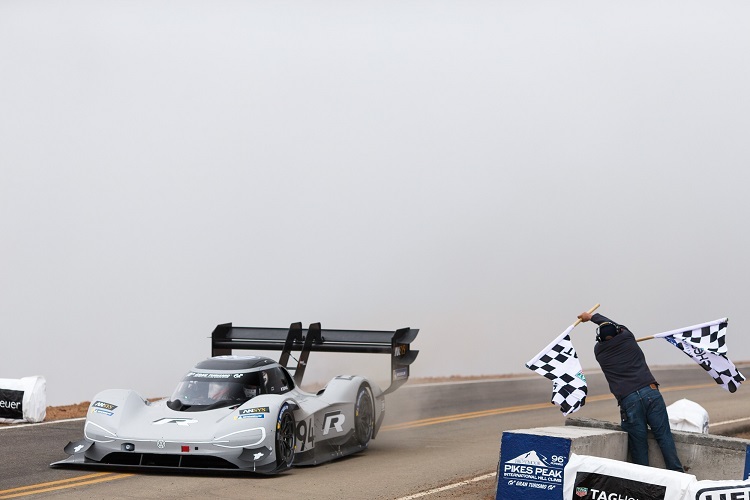 R Pikes Peak has hummed its way to the top of the Peak in record time – just 7 minutes and 57.1 seconds and VW said that breaks the old record by a significant 16 seconds. I.D. R Pikes Peak weighs less than 2,500 lbs. and produces 680 hp and 479 lb-ft of torque, giving it a 0-60 time of 2.25 seconds—faster than even Formula 1 and Formula E cars. Romain Dumas broke the previous record set by Sebastien Loeb overcoming some fog about half way up the hill. What do you think? Does this British survey also reflect what is happening here in the U.S.? Arguments over speeding are the top cause of bickering between couples in the car – and older people are THREE TIMES more likely to criticize their partner’s driving than younger passengers. That according to a survey of nearly 1,200 motorists. While less than one in ten people under 34 report their partner indulging in back-seat driving, more than a third of drivers over 55 criticize their partner’s handling of the car. Topping the list of complaints is speeding – but braking too late and too hard or taking unnecessary risks come close behind. 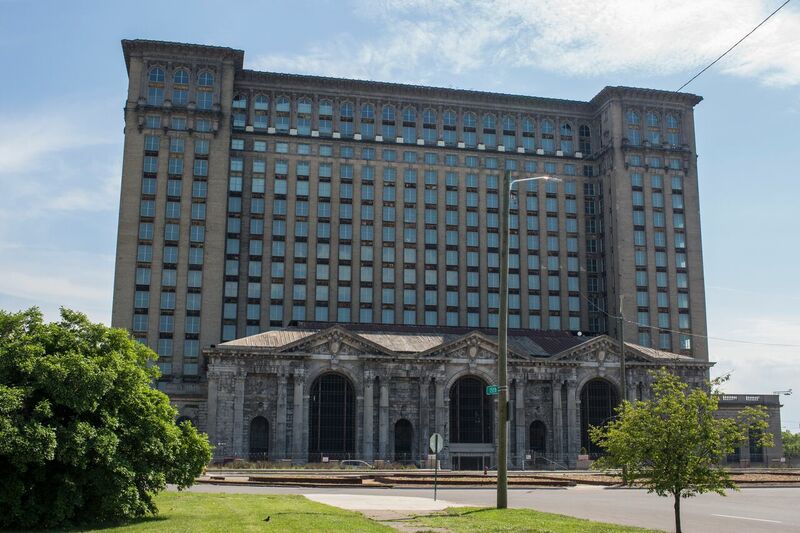 Four thousand people turned out for an open house at the former Michigan Central Railroad station in Detroit, just purchased by Ford. That is way more people than the old train shed has hosted in decades. The automaker will construct a complete campus in and around the station to house 5,000 workers who will develop self-driving and electric vehicles. Ford faces a lot of restoration work before workers arrive by the year 2022. Detroit residents are excited about the restoration that they hope will spark similar moves as part of a larger downtown revival. DAMASCUS, MD. 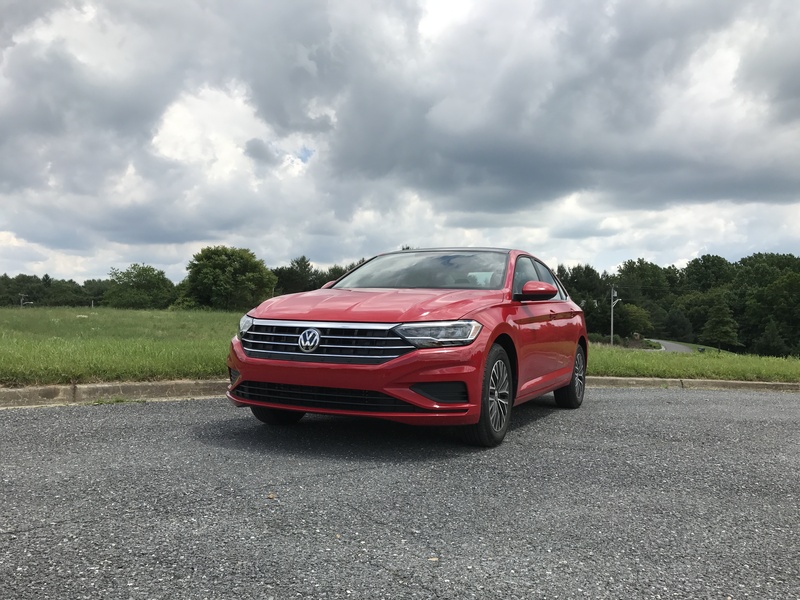 – Well, the name is the same but just about everything else is different in the new Jetta. 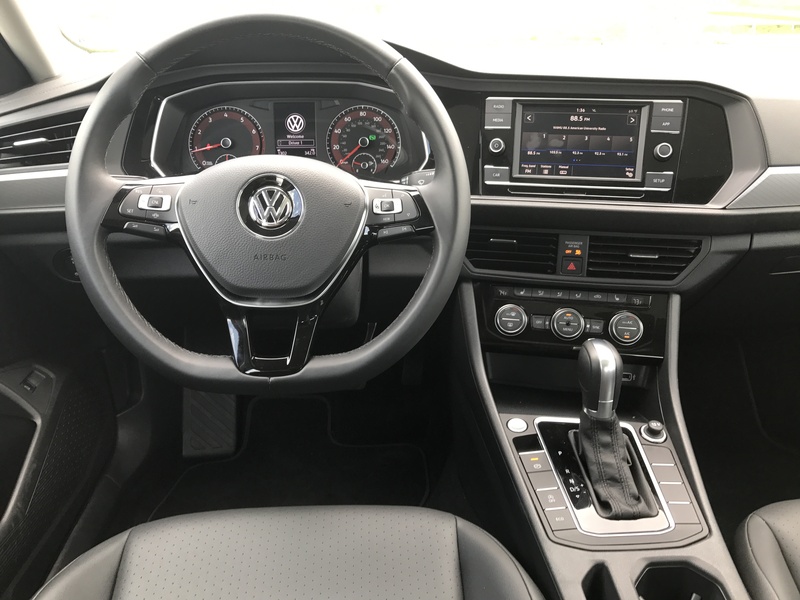 It now rides on a new platform, VW’s MQB, there is a new body design, (slick I think), some additional head, knee and shoulder room inside, the center console housing the infotainment system and ventilation controls is now slightly angled toward the driver. Overall, it is longer, wider and taller than outgoing models. Remember when Detroit brands made that claim every new model year? And there are five Jetta trim lines: S, SE, R-Line, SEL, and SEL Premium. The Tornado Red test car was an SE and modestly equipped thus giving a good idea of how it would be to live with a Jetta aimed at those with more modest bank statements. Pricing for the 2019 starts at $18,545 for the base S, and $22,155 for the SE. Prices work their way up to $26,945 to start for the well-equipped top-of-the-line SEL Premium. By the way that base price for the S model is $100 less than the 2018 model. Smack dab in the middle of the dash was a 6.5-inch capacitive touchscreen display that was easy to figure out, and thank you for that VW. Smartphone integration is standard and works with Apple CarPlay and Android Auto. More than one USB port would be welcome. A 1.4-liter turbocharged, direct injected four was the power plant with 147 horsepower and 184-lb-ft of torque. Peak torque is reached at just 1,400 rpm which made for excellent pickup in suburban driving, but things were not quite as brisk merging on to interstates. Check that out! No engine shroud!!! An eight speed automatic, two more gears than the previous model, is the only transmission offered on most models, but the rare base might come through with a six speed manual. Only on a rare occasion was there any turbo lag, in fact, it was much more responsive than many 15-year-olds. The strut type front suspension and rear torsion bar setup resulted in a smooth ride even over roads that the county repair crew had apparently abandoned. Back country roads were fun but steering feedback was muted. One can manually change gears via the shift lever. 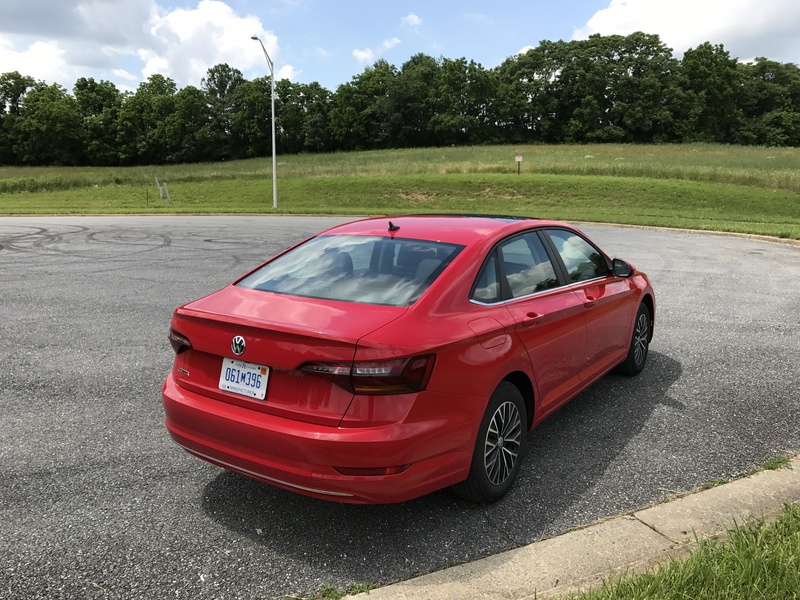 Those seeking a sportier Jetta may want to wait for the GLI model expected in 2019. 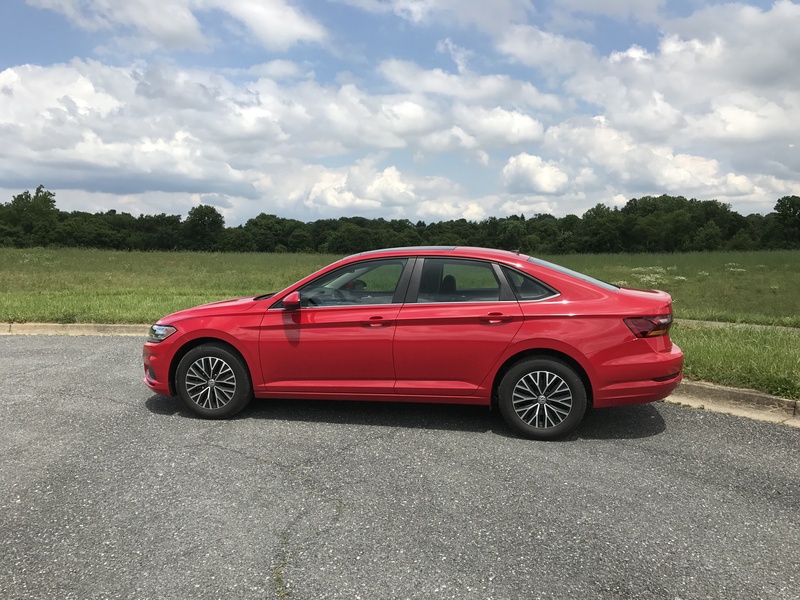 All in all, the new Jetta was a comfortable, spacious and fun sedan, one that I eagerly looked forward to driving every day. It more than holds its own in the sedan market and yes, there still is such a thing these days. Don’t overlook the 6-year, 72,000 mile warranty. VW has sold more than 17.5 million Jetta’s worldwide since it was introduced in 1979. More than 3.2 million have been sold here in the U.S.